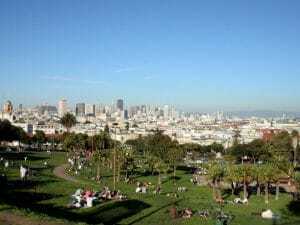 Perched on the highest hilltops of San Francisco and above nearby Fisherman's Wharf and North Beach, Russian Hill is a nabe that encapsulates the charm and mystique of the city. The Hyde Street cable car crosses the famously crooked Lombard Street with a number of lesser-known attractions like Macondry Lane and Ina Coolbrith Park inviting those who can to find them. Staircases replace the steepest sidewalks here, where stately homes and apartment buildings are the signature of this elegant hilltop nabe. If all of San Francisco is known as “hilly,” Russian Hill is on of the steepest nabes. One of the houses on Lombard street was home to the San Francisco “Real World” cast. 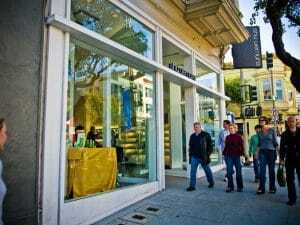 Hyde street has great boutiques. Polk Street is the main artery. You’ll find a lot of the wealthier Russian Hill residents higher up on the hill and “regular folk” towards the bottom (symbolic?). Right on the historic cable car line, which makes living in the neighborhood feel like quintessential San Francisco living. Don’t be fooled by the title, the only thing Russian about this nabe is the name. 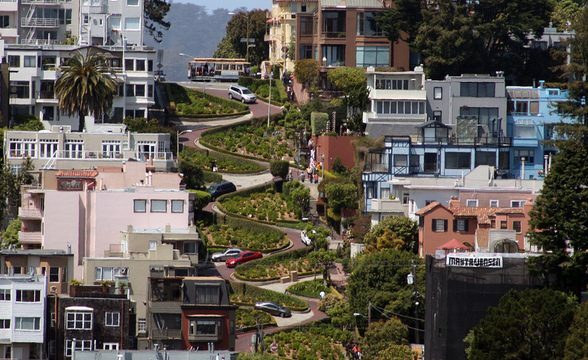 Instead of snowy views that resemble St. Petersburg, Russian Hill is quintessentially San Francisco, and boasts one of San Francisco’s most well known assets, Lombard Street. Surrounding the famously crooked brick road are beautiful and extravagant houses that have often stayed in the same family for at least 100 years (actually, scratch what I said before. There is something else resembling Russia on Russian Hill; the residents keep mostly to themselves, though they are polite and nice). Don’t let that scare you away from trying to live here, however. Though rent is relatively high (you’re looking at $1,500-$2,000 a month for a one-bedroom) they aren’t as high asPacific Heights, or, say, Manhattan. The peak of this nabe boasts stupendous views of San Francisco, Marin County, the San Francisco Bay….basically the entire Bay Area. Russian Hill is a quaint neighborhood with cable cars and cosy cafe’s. 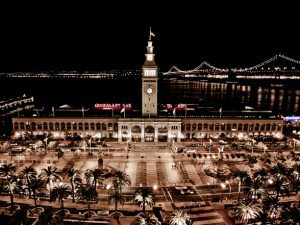 Bound by the Fisherman’s wharf to the north and(s)Nob hill to the south, it has North beach to its east and Pacific heights to the west. When you’re there be sure to check out the Crooked street (Lombard),enjoy the exquisite architecture tumble down the hill to Fisherman’s wharf and take the cable car back into the city. It’s Name: named for the discovery of a small Russian graveyard found at the top of the hill in the 1800′s, the graveyard is long gone from Russian Hill but the name has proved enduring. Crooked Streets & View Parks: World famous Lombard Street, which is a part of the neighborhood (although the crookedest street in San Francisco is actually in Potrero Hill). The Alice Marble tennis courts and Ina Coolbrith park are two neighborhood spots that offer an amazing opportunity to enjoy the view while you get your sport on. Literary Inspiration: The famed “Tales of the City” series by Armistead Maupin were inspired by Macondry Lane on Russian Hill, and tourists regularly flock their to have their pictures taken. Want to see the whole list? Cable cars, views, sunshine…Russian Hill has it all and loads of class too. I’m a big fan of Russian Hill, a neighborhood that for me defines old school San Francisco. There are some great, intimate restaurants and wine bars peppered around the nieghborhood and beautiful homes too. One of my favorite parts about Russian Hill is its network of alleys and staircases that are hard to find but real treats when you do. The views are pretty stunning and often you can see from the Golden Gate to the Bay Bridge. The sound of the cable cars and the fog horns add to the great atmosphere up here.